It was early on 20 Jan 2018. There they were, nicely paired behind the trees. Venus is the brightest. I set the iPad on the mantel for a long exposure (~20 min) to document their rise. Some stars joined them. 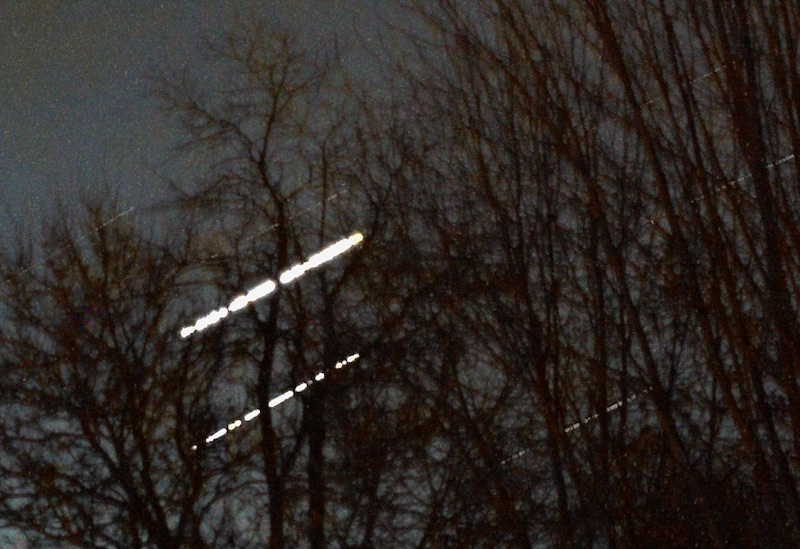 This entry was posted in Backyard and tagged Astronomy, Jupiter, Photography, planets, Venus on January 22, 2019 by Jim R.
PhoebeCam – a long stick, small digital camera, macro mode, 10 sec timer, and flash. It was a success. But, I was scolded harshly by the parents. They did not like my intrusion on the nest territory. Back inside the house, I watched through a nearby window. 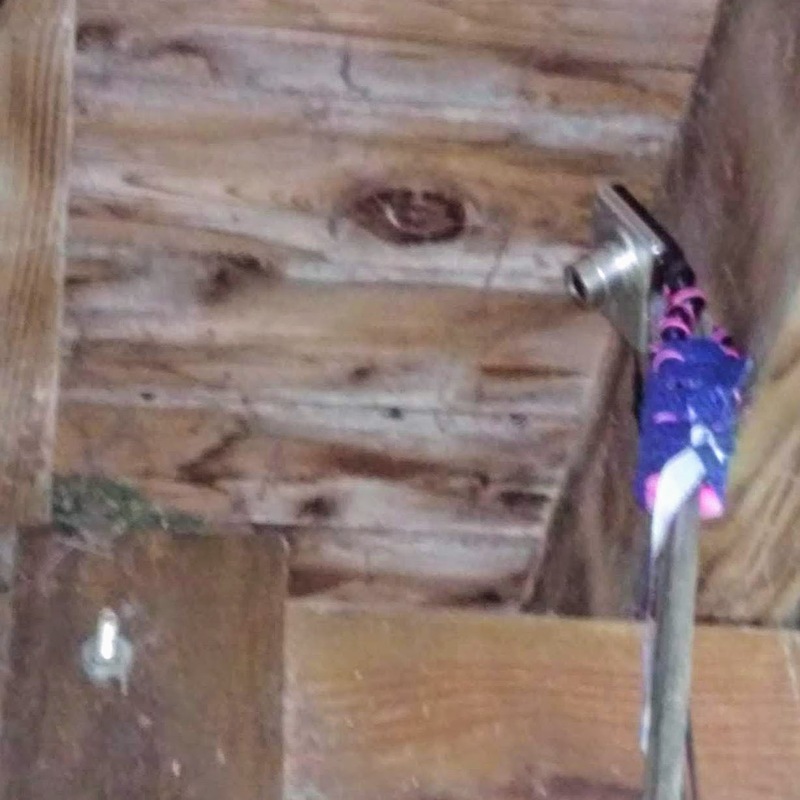 One of the parents scouted the space under the deck very carefully. It looked over the long stick. It was very vigilant. I will leave them alone now. 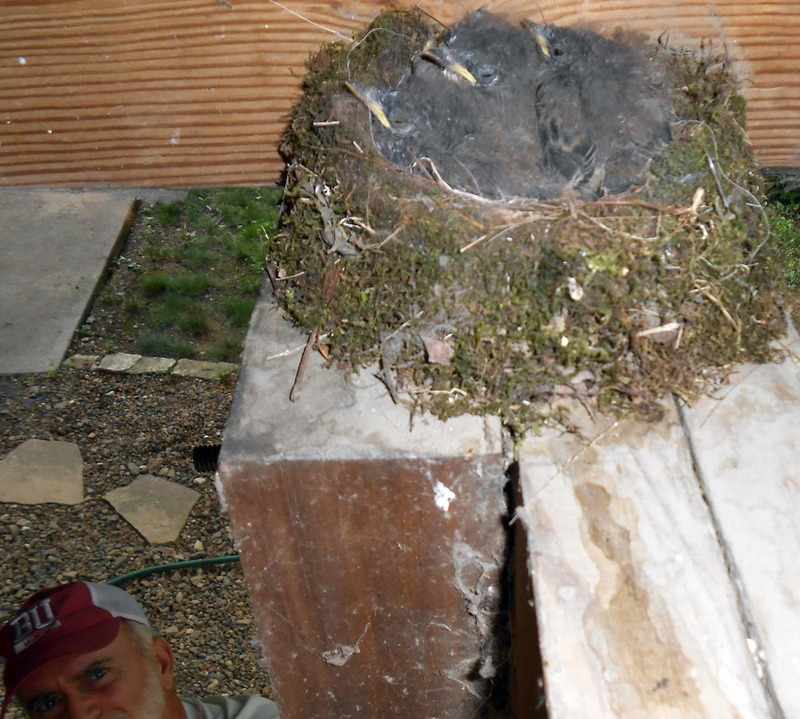 This entry was posted in Backyard and tagged Eastern Phoebe, Nature, Photography on June 12, 2018 by Jim R.
We have enjoyed watching our new neighbors, a pair of Eastern Phoebes who took up residence under our deck. Previous posts about the nest location, tail wags, and 3 eggs are here and here. We are happy to say the eggs have hatched. Mom and Dad are busy gathering insects to feed the babies. They fly to a perch not far above ground. There they scan the grass and bushes nearby for movement of insects. They must have excellent vision. Upon spotting something, they quickly fly to it, grab it with their beak, and fly back to the perch. After a few quick tail wags, they thrash the insect left and right on the perch a few times and fly to the nest to put it into a wide mouth. 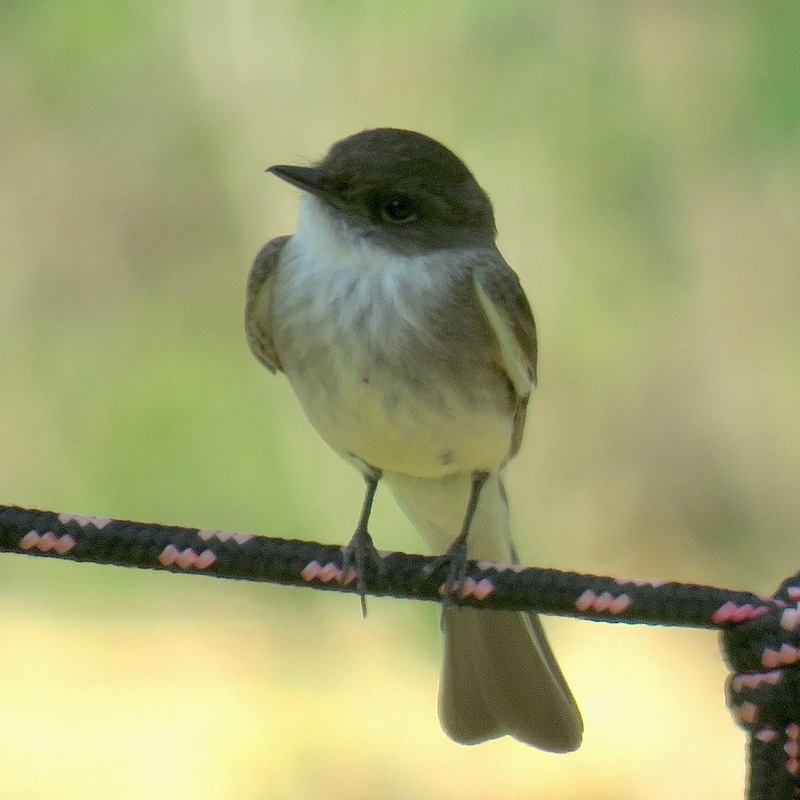 This entry was posted in Backyard and tagged All About Birds, Birdwatching, Eastern Phoebe, Nature, Photography on June 11, 2018 by Jim R.
The young new-moon emerged from the glare of the Sun last weekend. It is moving toward a second full-moon of the month on 31 March. Two full-moons also appeared in January. None in February. 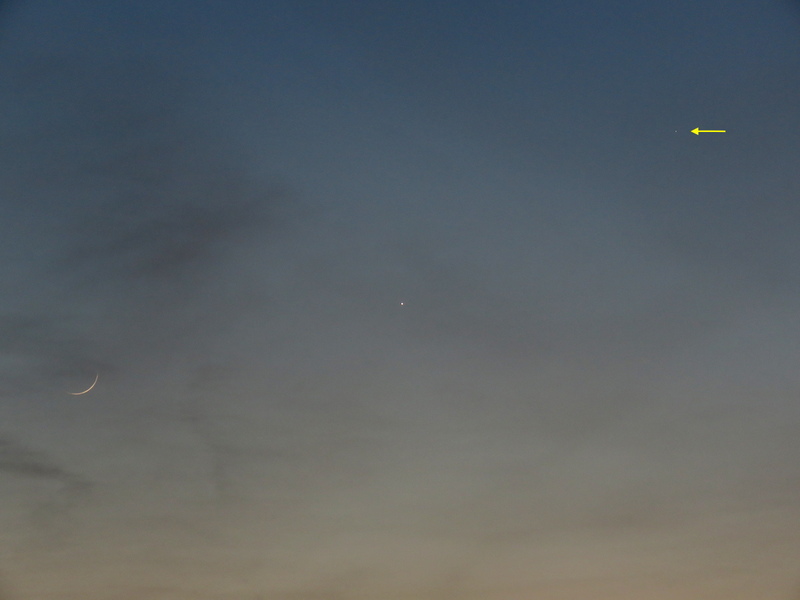 Also present in the early evening sky were Venus and Mercury (arrow). Enlarge the image to see Mercury. About 1% of the Moon was illuminated at that time. It was a cooperative subject for this shot. Two hours later that evening our phone dinged with a text message from our son on the west coast. He attached this photo taken from his deck. It was fun to see the alignment again. Note that the Moon was a little higher relative to Venus in his photo. 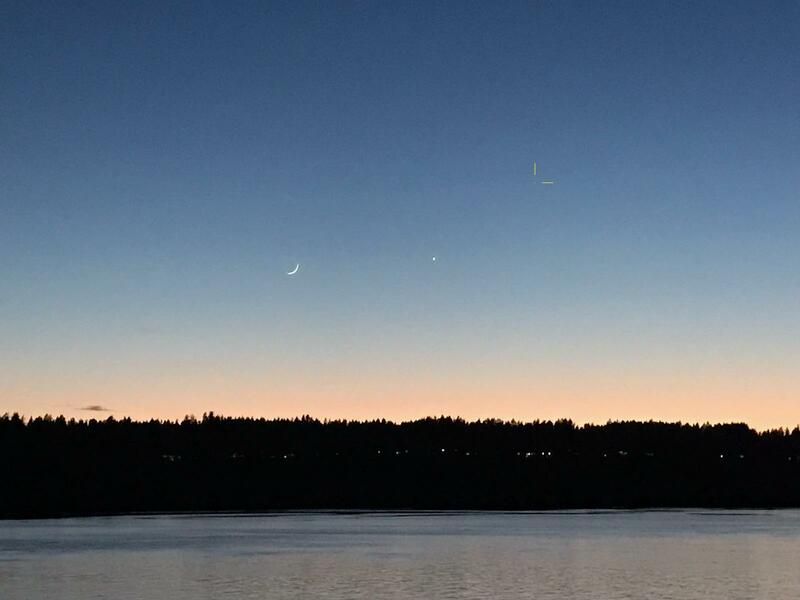 This entry was posted in Astronomy and tagged Mercury, Moon, Photography, Venus on March 19, 2018 by Jim R.
There it was shining into the bedroom windows low in the western sky. By the time it reached the full SuperMoon phase at 9:46 am CST, it would be well below the horizon. 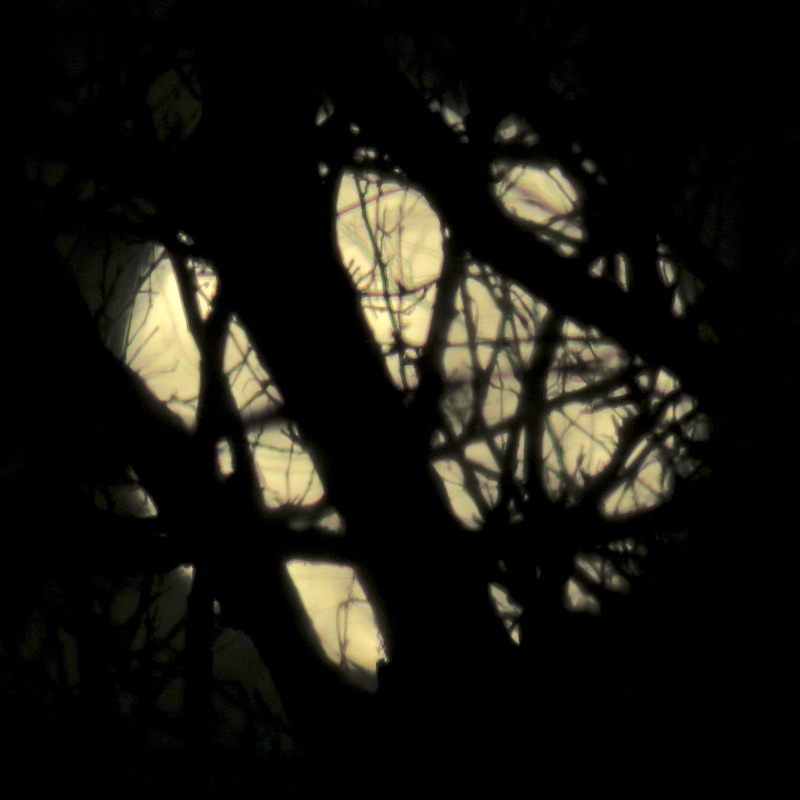 I give you the almost SuperMoon just before setting. Sorry about the trees being in the way. This entry was posted in Backyard and tagged Astronomy, Moon, Photography, Supermoon on December 3, 2017 by Jim R.
After a large breakfast at Johnson’s in Elkader, we drove south toward Strawberry Point. Did you know they claim to have the world’s largest strawberry on display above city hall? We’ve seen it many times. By our judgment, at 15 feet tall, it is the largest. This entry was posted in Hiking and tagged Backbone State Park, Devil's Backbone, Iowa, Nature, Photography, state park on November 11, 2017 by Jim R.
Our view from Iowa this morning toward the pre-dawn sky was clear. High in the dark sky was Venus. Planets Mercury and Mars were supposed to be about halfway down toward the horizon. I have looked for them the past few mornings with no success. Either I was late to look and the sky was too bright, or some clouds were in the way. This morning I looked earlier at 5:55am and the sky was very transparent. Success! 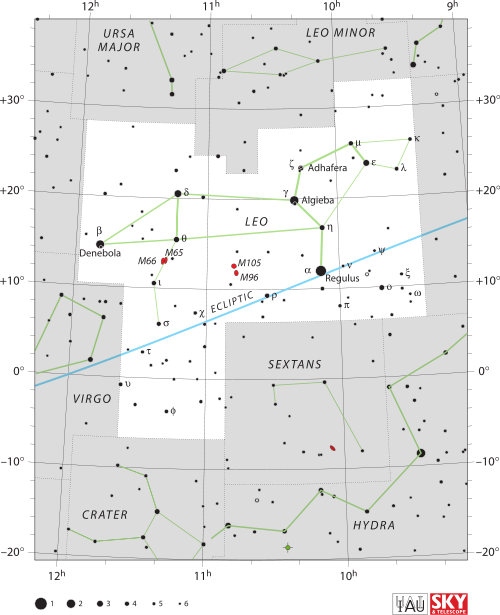 Reg is the star Regulus in the constellation Leo. It photo-bombed the scene next to Mercury. 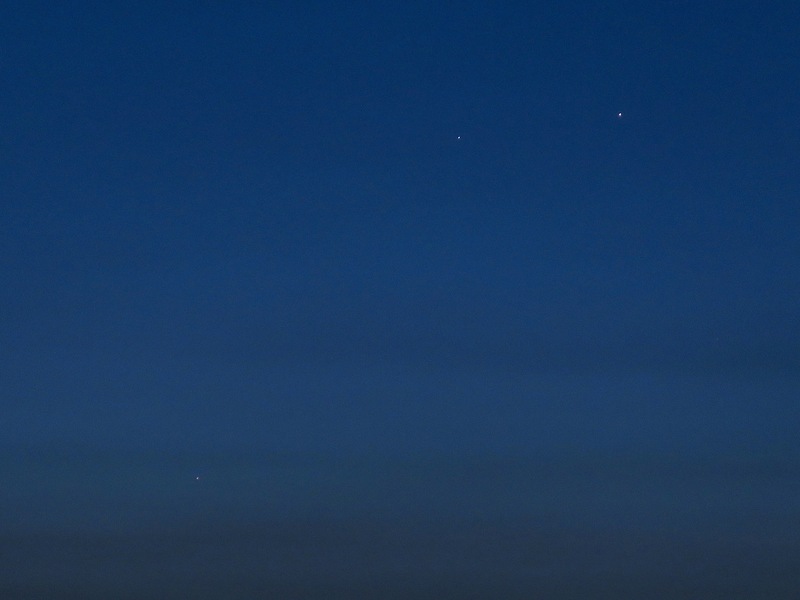 The view this morning actually included four planets if you count the Earth beneath my feet. 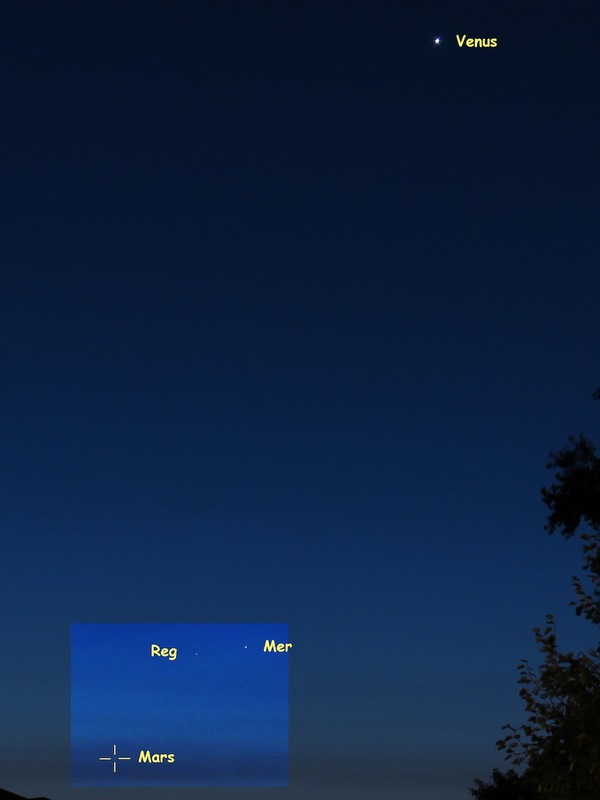 This entry was posted in Astronomy and tagged Mars, Mercury, Photography, planets, Venus on September 9, 2017 by Jim R.
It was a beautiful morning for a walk with temperature in the low 60s and clear sky. 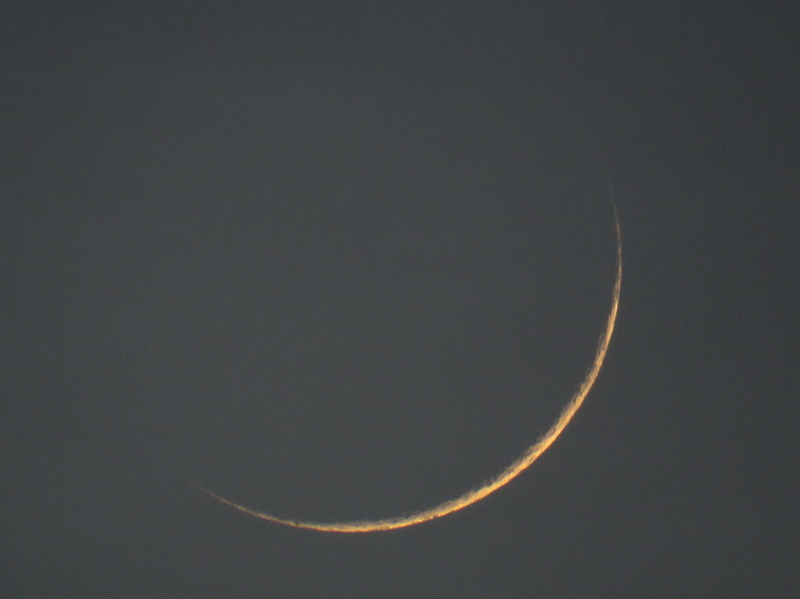 The waning moon was visible above the western horizon. It was heading east for the grand solar eclipse on 21 August. We set out from this location in Solon, Iowa. We walked about two miles west and then headed back. Lake Macbride trail heads west from the parking lot. It is mostly flat as it passes several wooded areas and native prairie restorations. Numerous wildflowers were showy in the prairies. Especially colorful were the yellow ones. We captured photos of as many different ones as we could find. There might be some duplicates. We made no attempt to ID them. Fellow blogger Eliza Waters offered some IDs which are in the photo descriptions. See her comment below. All photos can be viewed larger for details. This entry was posted in Nature and tagged Hiking, Iowa, Outdoors, Photography, Wildflowers on August 15, 2017 by Jim R.
I just starting walking down the street and looked up. 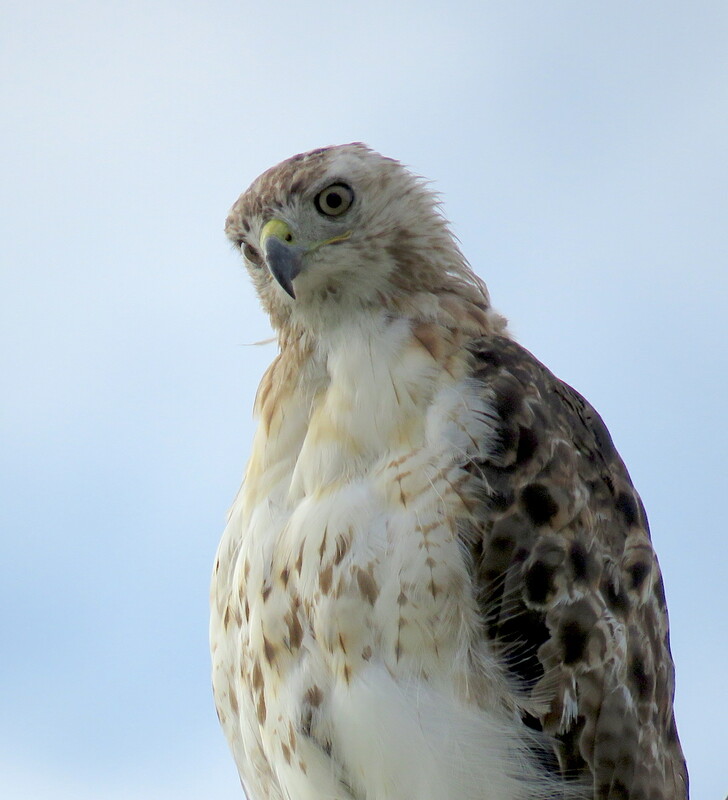 Sitting on the nearby light pole was this hawk staring down at me. The angle was bad to get a positive ID. It didn’t seem large enough for a Red Tail. It seemed more likely a Cooper. The tail was straight down on the opposite side of the pole. I couldn’t get in position to see it. What do you think it was? Click any image for more detail. 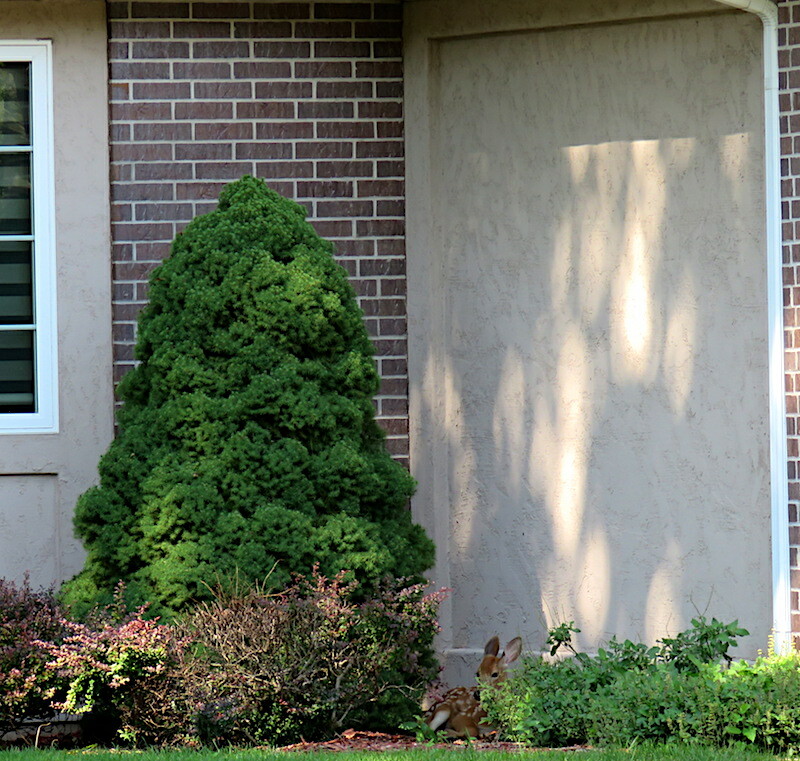 This entry was posted in Birds and tagged Birding, Hawk, Nature, Photography on August 3, 2017 by Jim R.
I stepped out the front door to see if anything was going on in the cul-de-sac. A slight motion caught my eye in front of the house across the way. I watched for a few moments. It was there in the bushes and plantings. I went back into the house for my camera with a long zoom lens. The fawn rested quietly in the shade. The doe was nowhere to be seen. It remained there several hours. During the first 4 weeks, a fawn is commonly left in grassy protected areas while the doe forages. The people who live there came home, opened the garage door, drove the car inside, and closed the door. The fawn didn’t budge. It was gone the next morning. This entry was posted in Backyard and tagged Deer, Nature, Photography on July 24, 2017 by Jim R.